Moderator Greg Sterling, founding principal, Sterling Market Intelligence, asks how many people were in the Steve Ballmer keynote this morning? Everyone raises their hand. Who found it substantive and interesting? Most keep their hand raised. One of the things that came up a number of times in the conversation is the growth of mobile search. Even Ballmer was surprised the volume, the monetization and the clicks in the mobile arena. A user’s search behavior on a mobile device is often much more immediate and focused than it is on a PC, Greg explains. So with that, let’s take a look at the marketing opportunities in mobile search. 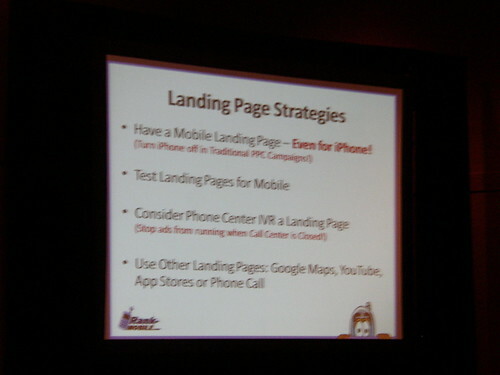 Marc is up first with a presentation on how to take advantage of mobile search opportunities. He’ll cover the basics, along with Web site optimization and strategy. Mobile search differs from computer-based search. On computers people have a long conversion process. On mobile devices it’s much quicker because people are on the go. To advertise on mobile, you want to sell something and you want to drive consumers to brick and mortar locations. This raises issues with tracking. Design for usability of the core function of the site. Don’t design for comfort or style. Wireless Application Protocol (WAP) should be enabled. Example: Home Depot. The Home Depot has a great Web site. If you click on Home Depot’s main PPC ad, the resulting site is too hard to navigate. A much better example is Best Buy. They’re design is very different than their traditional site, and is designed around generating conversion. Isolate mobile into a unique campaign: The CTR and quality score will likely be lower in mobile, so isolating the campaign will likely help with this scenario. Visibility: If you’re not in position 1 or 2, you’re likely not going to get a click. Mobile vs. PCs: Don’t drop the long-tail keywords in your mobile campaigns. If you have a low rank, you have a low click-through rate. Reid is next. He’ll be covering the maturity of the mobile search market. Microsoft has offered handset targeting for a while but it would be nice if they beef up the support. Yahoo! has mobile search platform, but we understand that anything built on the Panama platform will be short-lived, so focus more on Microsoft. Google app store display URLs. Trademark Terms: As expected, trademark terms perform well in mobile. CPCs are lower for mobile. With impressions and clicks, there’s a big difference with mobile at the low side of a large gap, however it is up from the past. With a number 1 ranking, the clicks are very similar between mobile and desktop. And conversion rate is equalizing between mobile and desktop as well. If we can target by handset, and a certain handset is owned primarily by men and women 18-25, we have a sloppy way of demo targeting. Think about the business-minded Blackberry demographic. There’s not a lot of data they can present regarding conversion rate by handset, but there’s a slightly higher rate of conversion for Android than iPhone, with no data available for BlackBerry and others. Usage patterns: desktop traffic peaks at 8-9 am, while mobile search peaks around 10-11 pm. Percentage of clicks without referring domain is about 32 percent for mobile and 20 percent for desktop. Percentage of clicks without referring keyword is 70 percent for mobile and 26 percent for desktop. This makes it very hard to find negative keywords and how to split off new campaigns for mobile. Should the iPad be categorized as a mobile device? Persistent data connection combined with the fact that it’ll be out in the wild soon, he thinks it should. It’ll be a question we have to answer. Cindy is next with a presentation on Google Mobile PPC. Almost every year, the world wide mobile search advertising spend is doubling. By format, mobile message advertising is the highest and mobile search advertising is growing at a million dollars a year. What are Google’s Mobile PPC Offerings? Raj is next to talk about mobile search and mobile search ad opportunities. Mobile search is going mainstream. What are people looking to do on mobile? Decision making on mobile: Mobile search chains are much shorter than PC search chains. Analysis of query chains shows users tend to act quickly based on the information they get from their mobile search experience. This shows the power of mobile to influence users’ decisions close to the final point of purchase. Multiple screens work better together: adding mobile aspects to a PC campaign multiplies the effectiveness. Users are using mobile today to find quick answers do research on the go, navigate in the world and inform their purchase decisions. Combination of a multi-functional device with access to users’ real-time location that is present with users 24/7 enables very compelling search and navigation scenarios. Advertisers should think of mobile as a force multiplier rather than a stand-alone medium. Multi-screen adverting shows better results across multiple metrics as compared to single screen advertising. Reid: Today’s announcement about click to call is important. Sometimes you can’t get everything done on a phone, but it is a phone. Be able to field calls. Raj: Users are looking to use mobile closer to the point of decision making. Get in early and start learning as the industry becomes smart about this channel you’ll be at the forefront.